I like it. Thanks nikos! I like it. Thank you nikos! Great Nikos. Now, I have a Silver cursor when I update my Silver Surfer Windowblind. Much Thanks. hmmmm.... for some reason, I can't seem to get this installed, adni. Any ideas? The normal pointer is invisible, makes it kinda hard to navigate the desktop. river55IL, simply change the extension of the downloaded file from .zip to .CurXPTheme. It should work fine after that. Great cursors! I like the glassy look! 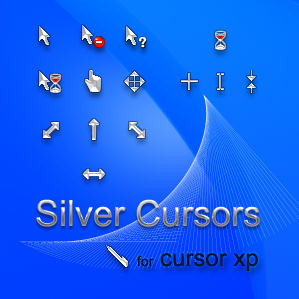 Awsome cursors. I like them Nikos. Brad43: Try reinstalling the cursor. If it still doesn't work, try reinstalling CursorXP. Please ignore my post below. I figured out what I was doing wrong. These don't work,would you please reupload them.I've tried Cursor Xp & normal cursor Windows Xp(trying off cursor XP in other words) & i got nothing Could & would you fix these Nikos? I would love to add them to my collection of your works,Thanx Hon'as always for your talents. For the problems you have mention, I have send a CurXPTheme, but, as I have check it now, it is a zip file. Just rename the zip file you have download from Silver.zip to Silver.CurXPTheme and the cursors will work fine with CursorXP. For the second problem, the invisible pointer, I really don't know what is going on, it works fine in my computer.